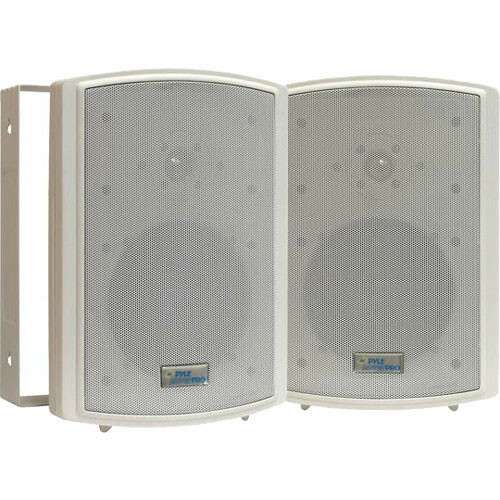 The PDWR6T 6.5" Indoor-Outdoor Waterproof Speakers with Transformers (Pair) from Pyle-Pro is intended for use on boats, marine environments, decks, patios, poolsides, or any other setting where moisture or water are present and could otherwise damage traditional speakers. It offers a 6.5" long throw woofer and a 1" polyamide dome tweeter. Other features include a 60-ounce magnet structure, a rugged plastic enclosure, spring-loaded "U" mounting brackets, and a 30W 70V transformer. This unit includes (2) speakers. Use this unit to achieve an audio installation impervious to water and moisture in indoor or outdoor settings. Dimensions (HxWxD) 13 x 9.25 x 7.25"
PDWR6T 6.5" Indoor-Outdoor Waterproof Speakers with Transformers (Pair) is rated 3.7 out of 5 by 3. Rated 3 out of 5 by zadar from PDWR6T - Low sound output This speakers sensitivity is rated as 94 dB ! It sounds more like 82 dB to me. I have to crank my amplifier all the way up to get some decent sound getting out of it. I'm disapointed. Rated 4 out of 5 by SoundJedi from Sound Great I bought two sets of these speakers to hang in the work out area at the church where I work. They sound good and have decent output.